It was exactly 20 years ago at the 1999 Geneva Motor Show when Horacio Pagani, nearly unknown in the industry at the time, revealed the first supercar that bore his name. The Pagani Zonda C12 was shown to the world for the first time two decades ago and the supercar and hypercar segment was changed forever. To celebrate the past two decades, during which only 140 street-legal Zondas have been built, Pagani has announced details and released the first photos of the completely restored Zonda C12 chassis 001. This wasn’t just any other Zonda C12, aside from being the first Pagani. Chassis 001 was not only driven many miles during initial testing, but was also used for the homologation and crash tests. Power, of course, is from a Mercedes-Benz-sourced 6.0-liter naturally aspirated V12 with an output of 450 hp. Thanks to Pagani’s own in-house restoration program, Zonda C12 001 has been returned to its former glory. Pagani started by restoring existing parts and then moved on to rebuilding original components according to precise specifications contained in its archive. Work was also done on the car’s electronic systems, suspension, wheel hubs, and the four exhaust pipes. Pagani specifically points out that even the screws and bolts were restored as needed. The Puro Silver livery looks as stunning as ever. 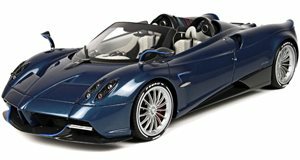 Also making an appearance at Geneva is a unique US-spec Huayra Roadster with a fully exposed Blu Tricolore carbon fiber body in a matte finish with Bianco Malta white accents, and a blue and white leather interior. Pagani points out that delivery has been completed for more than half of the limited production Huayra Roadsters to clients across the globe. We’ll be speaking with Horacio Pagani himself this week at Geneva so expect more details and plenty of live photos.